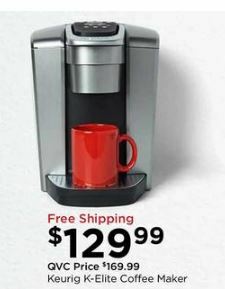 Find the best deals on Keurig coffee makers during Black Friday 2018. 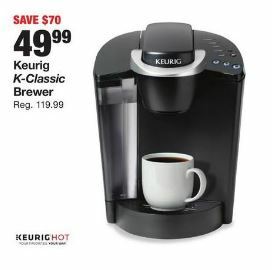 Find the online sales and price discounts in print ads for the Keurig K-Elite coffee maker, the K-Mini, K200 and K50 between Thanksgiving Day and Cyber Monday 2018. 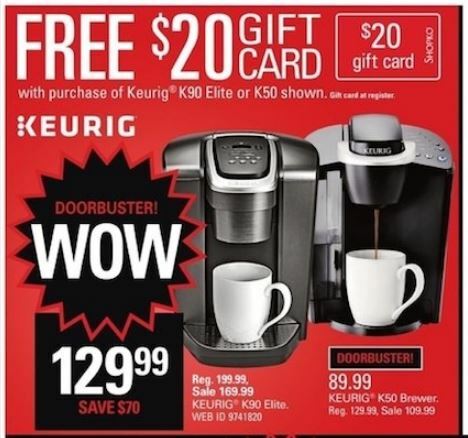 Click Here to Save $125 on Keurig K-Cafe and 24 count K-Cup Pack on Amazon for CYBER MONDAY. This single serve coffeemaker is the latest model of the popular home and office brewing machine. Kohls includes $30 in Kohls cash, and Best Buy will give you a $30 gift card card for purchasing the K Elite. The K Mini is Keurig’s slimmest single serve ever at less than 13 cm wide. Just add water and K-Cup. A compact Single Serve K-Cup Pod Coffee Maker available in fun colors for your kitchen. A single serve K-Cup Pod with three possible cup sizes and removable 48 oz. water container from the Classic Series. This is on sale for $89.99 at Shopko as part of their Friday doorbusters plus you get a free $20 Shopko gift card. That’s $60 in savings off the regular retail price of $129.99. We have posted a number of the ad deals already above. If we find any more this year, we will post them here as well! We will post all of the online sales for the Monday after Thanksgiving here when they are available after Thanksgiving.